Members of the Lindenwood lacrosse team show their tattoos in honor of Isaiah Kozak who took his own life in March 2017. 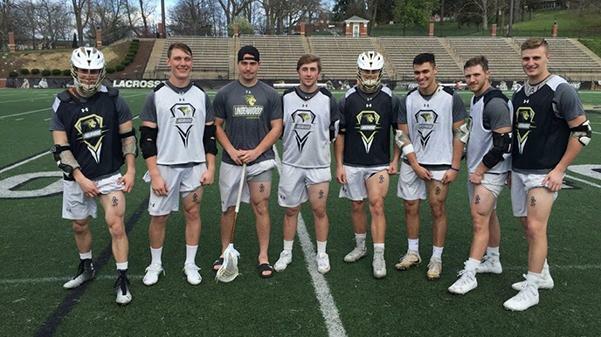 Close friends and teammates of deceased Lindenwood men’s lacrosse player Isaiah Kozak have decided to pay permanent tribute by getting matching tattoos in his honor. Junior Max Troha and the rest of the team had thrown the idea around of getting matching tattoos for a while, and when Kozak died, Troha had realized the tattoo they had all talked about now had a chance to mean so much more than a bonding mark. Troha’s artistic reputation from the other players made it easy for others to buy in and trust his design. Of the 16 people who signed up, eight ended up with the ink Troha designed. In addition, another member of the team also got a unique design in Kozak’s honor. The urge to look at any freshly inked tattoo has affected the eight on the team who got them. Although Kozak’s death was tragic, the team wants to and will remember him for the good and the spontaneous, fun-loving teammate, person and friend he was. Any students struggling with mental- health issues are strongly encouraged to talk to someone. Joe Cusumano, director of the student counseling and resource center, may be reached at his office on the third floor of Evans Commons or by calling him at 636-949-4528.